Andrew Kerr, 35, from Broxburn, West Lothian, was visiting a friend in Edinburgh when the window of his 4×4 Honda CRV was smashed and raided on Brunswick Road in Leith. The thief then took off with his blue flashing lights and time saving SatNav system, while also causing damage to the vehicle. It meant Mr Kerr, who gives up around 12 hours of his time per week, was off the road for seven days, unable to answer emergency calls. 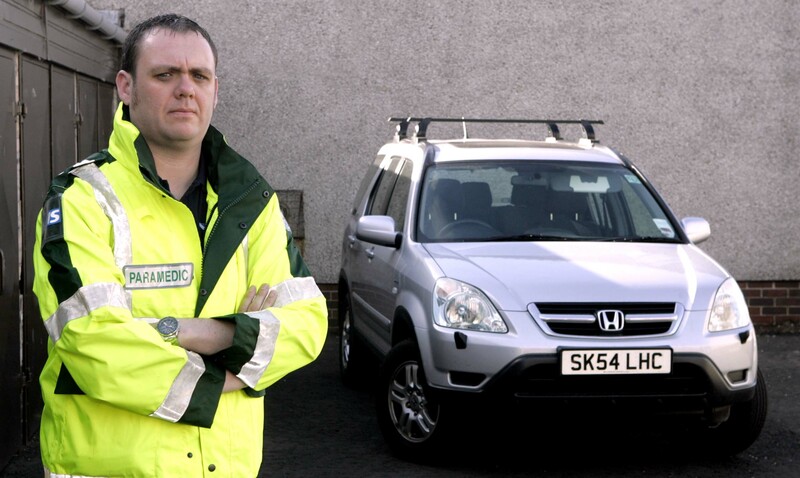 Mr Kerr used to be full-time paramedic with the ambulance service for 12 years, and since then he has spent three years volunteering with Basics Scotland, a charity organisation that provides first response support for Scottish Ambulance. He said: “My main job is working off shore on oil rigs, which means I do five weeks on and five weeks off, so when I am home I generally always plan some time to volunteer. “This whole week I was scheduled to be on-call, but now I can’t do any of it until I get insurance money to buy new equipment. “I spend a lot of time in my car, and now I know what it must feel like to have your house broken into – I really do feel violated. “I just don’t know why someone would do this – there was nothing in view – I make a point of putting everything away so the vehicle always looks empty. Mr Kerr said he spoke to a woman who witnessed the incident – which happened at the Easter Road end of the street on Sunday 22 August between 8-9pm – and she told him the thief ran off in a flash. He said: “The girl couldn’t tell me or the police much, as she said it was over as quickly as it started. “Apparently after he smashed the window on the passenger side he just grabbed what he could and got out of there – leaving a right mess behind him. “There is not much of a description either, so it’s likely the police won’t catch him now. “All in all I think he robbed about £1,000 worth of stuff, which I had bought mostly out of my own money because I didn’t want to take from the charity. The vehicle had also been damaged on its exterior, due to the broken glass cutting into the paintwork, and even some parts inside the vehicle had been scraped. Mr Kerr said: “Thankfully the car is still drivable, but until I get money to replace my equipment I won’t be able to get out on any jobs. “I’ve been really upset about that because it is my way of giving back to the community, and I’ve been doing it for so long now, it doesn’t seem right having to stay at home. A police spokesman said: “Lothian and Borders Police are investigating following a break-in and theft from a vehicle in Brunswick Road. “An emergency service blue light was stolen during the incident, which happened around 8.50pm on Sunday 22 August. Councillor Louise Lang, who represents Leith Walk ward, said: “Any kind of theft is of course criminal but when it’s clear that a vehicle is being used to provide a vital service to others, this kind of damage and theft is appalling.